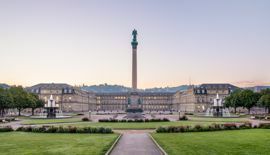 Stuttgart is one of the most popular German cities that annually welcomes numerous tourists from all around the world. This city has so many attractions you simply can't miss. Hence, the most famous and visited places are the Mercedes-Benz or Porsche Museum, Cmt Urlaubsmesse Auf Der Messe in Stuttgart, Teehaus Weissenburg Park, or other remarkable destinations. However, visiting this city with your friends and passing by the best restaurants and bars is unforgivable. Some of the most known eat or drink establishments include Sausalito Stuttgart, John-Cranko-Lounge, Blinde Kuh, Bernstein Bar Restauration, Billardsaal, Denoar Stuttgart. Booking a minibus from a respectable van rental service has so many advantages. First of all, you already know there are numerous people relying on this particular van supplier and then you know their services do never cheat as the acknowledge that the risk of losing their good reputation is high. Accordingly, once you are in Stuttgart or any other European city, it will be wise to find a van rental approved by thousands of people worldwide. 8Rental is the type of above-described company, which you want to rely on. It can become your true "harbor" wherever you travel in Europe. Send us a quote now and let us proceed with your order so that you will be secure upon your arrival in the city! If you are already heading to Stuttgart with your friends to spend an unforgettable weekend and you are planning to spend the evenings in local bars drinking a glass of cool German beer then you should hire a van with a reliable driver who can take you wherever needed in safety and comfort. 8Rental offers the best conditions for hiring vehicles in Germany. Rent a minivan with a driver in Stuttgart to experience some of the most interesting and funny days of your life! Some of the most convenient minivans form the 8Rental' fleet are provided to all our clients. You can book a Mercedes Viano, Mercedes V class, a Mercedes Sprinter or Mercedes Sprinter VIP, depending on how many of you will be traveling in the vehicle. The first two models are relatively smaller than the others and can drive only up to eight passengers. The other two, meanwhile, are more capacious and will accommodate up to twenty-four people. 8Rental's vehicles are equipped with a line of the most necessary amenities such as premium safety system, air conditioning, central heating, an advanced audio system, air suspension, curtains, etc. Yet, if you need some extra ones such as a TV, a fridge or any other luxury, just let us know in advance. Finally, you can freely gather with all your friends and organize an unforgettable vacation in Stuttgart with 8rental comfortable fleet! A staff of professional drivers is what you can expect to meet when dealing with 8Rental. These are real professionals devoted to their job. They are licensed, experienced, and dependable. All of them are perfectly aware of the city's roads and will take the necessary direction the moment you tell the address. Once you hire a chauffeur-driven van in Stuttgart from 8Rental, you can choose the driver who speaks your native language. We have not only German-speaking but also English, French, Italian, Russian, Spanish speaking chauffeurs. 8Rental is glad to inform all its clients that there are some extras we provide for free. For instance, regardless of the length of your tour, the fuel will be included in the offer, just as the insurance. You are not responsible for any taxes or fees. Our clients can order the chauffeur and the vehicle they book to meet them right at the airport or the railway station. All that we do, is meant for our customers' satisfaction! Knowing you have a reliable driver waiting just outside the bar in a comfortable van, you and your friends can enjoy your time!